I love soup. All soup. Really I’ve never met a soup I didn’t like. Except maybe fish soup. Yeah, I don’t get that one. Maybe I should visit…I don’t know…somewhere where they eat a lot of fish soup? So, anyways, tortilla soup is one of my favorites. There really isn’t a way to mess this up. You can make is as mild, or as spicy as your taste buds require. Mine require some spice! My kids have sissy taste buds, but we’re working on it. 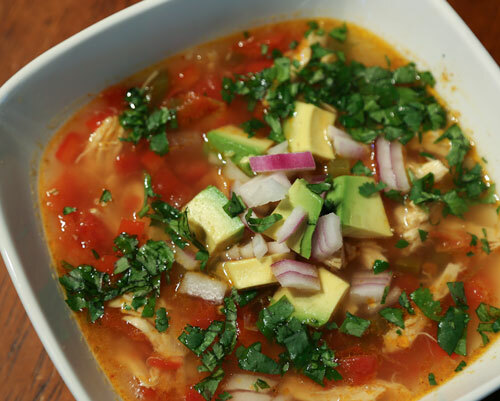 Here’s a simple Tortilla-less soup recipe, omitting the tortilla part and making it Paleo/Grain Free friendly. Forgive me if I don’t have exact measurements. To me, soup is made entirely by taste. Season some, taste. Season a little more, taste. Repeat over an over until YOU are satisfied. 1 whole chicken (for broth-recipe below), but you’ll only need about 1/2 of the meat. Chili Powder 1 tsp or more depending on desired spiciness. SALT- oh my gosh! so many people are scared of salt. But not you. Right? You like delicious soup and delicious soup requires salt. Start with 1 tsp and then as you are layering spices, increase by 1/2-1 tsp until you are satisfied. I love this salt because it actually hydrates instead of making you all puffy and bloated. To make broth, take the chicken (cut up into parts if you’re fancy-or not if you’re like me), 1 onion, 3 stalks celery WITH leaves and 2 carrots, whole peppercorns if you’re crazy, cover with plenty of filtered water, add 1-2 tablespoons of apple cider vinegar (this pulls all the nutrients out of the bones) and simmer for anywhere between 3-24 hours. 3 hours if you need the stock for tonight-skimming the foam as it comes up. Do not boil! Simmer slowly, as raising to a boil will bring out all the impurities real fast and you will not have a clear broth. Skim the scum during this time, you don’t want that in your broth. Drain chicken and vegetables and remove stock for soup. Pick off as much meat as you desire in your soup (I use about 1/2 of the meat and reserve the rest for another meal). I also take the already cooked vegetables and blend them in my vitamix (or any blender) with about 1 cup of broth and add it back into the stock. You know, waste not, want not. Sautee diced bell peppers, onion, and garlic in the bottom of a stock pot. I like to make my soup in my enameled cast iron, it tastes so much better. Use a little grass fed butter or coconut oil- maybe 1 tablespoon, sautee until onions and peppers are soft. Sprinkle a little salt at this point. Add broth, canned diced tomatoes with chiles and chicken and first layer of spices. Simmer for a while (15 min), add 1 tablespoon of tomato paste. Stir and taste. Salt if needed, by 1/4-1/2 tsp amounts, tasting as you go. While I love salt you don’t want to overdo it, you can always add more but you can’t really take it out. Keep simmering until the flavors meld, somewhere between 30-45 minutes. Keep tasting and adjust seasoning to your own taste buds. After simmering, remove from the heat and let the soup “rest” with the lid on for 15 minutes. Add in chopped cilantro now, or plate the soup up and add as a garnish at the end. Top with whatever toppings you like! I used chopped avocado, more diced red onions and cilantro. Voila! Deliciousness in a bowl.